I got my front door key stuck in the lock yesterday. I unscrewed the lock from the door last night. That oil you use for sewing machines? I put a bit of that into the lock last night. Nothing. "Did you fix it?" asked the Mama. "Did you get the key out?" asked the husband. In case you're pondering why the husband wasn't involved in figuring out how to remove the key from the lock, it's because I was bogeying the lock and he was washing dishes. I had handed it to him before he started the dishes. I needed him to use brute strength to jiggle out the key. He had success last week when his key got stuck in that same lock. But no such luck this time. How did I get the key stuck in the first place? "You used the wrong key," the Mama declared. "Did you use the wrong key?" asked the husband. Think, remember, recall. Yeah, I did. I left the lock, with the key stuck in it, on the stairway stoop. I was very confident the house ghosties would work their magic so that I could pull out the key with a snap this morning. The ghosties obviously had better things to do. That dry graphite you use for unsticking things? I sprayed a bit. . .no, a lot. . .of that into the lock this morning. Nothing. 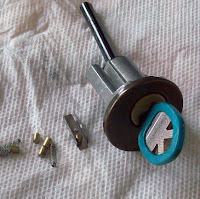 I took the lock apart before breakfast. All the tiny springs and solid bits ka-boinged out of the holes. That was fun. My key is still stuck in the lock. Three hours ago, we bought a new deadbolt lock. 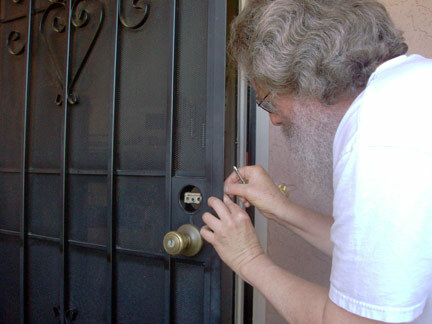 An hour ago, the husband and I installed a new deadbolt lock. Yes, I let the husband have some fun, too. I'm keeping the old lock. One of these days I will get my key out. Yep. Been there. That's how I learned to replace a lock. No, I'm wrong. I first changed a lock when we locked ourselves out and had to remove the lock from the outside to get in. Creative destruction. It's good for a little amusement, but the charm fades quickly. Zooks, Woman.....Locks and keys. Such a bother. I just "Kinda" starting locking my doors. The world is really changing when you have to start locking your doors in Montana. Even my son told me just a couple days ago that they were taking the airstream out for the weekend and he'd be locking his house doors. First time, ever, for him, too. Maggie, you remind me how lucky we were that we weren't locked out! I love this. No fear! Juat wade right in and mess it up. That's what I do. And sometimes it works. those scones looked good, to i'm not a scones fan. i don't get 'em. they're not sweet or savory. but i have had some good ones. Granny Sue: I was proud of myself for not panicking or concerned about not being able to get anything back together again. there's always Google to go find a troubleshooting answer. Ed: Maybe we have too many keys? I know I have too many keys, but not enough to wear 'em like a custodian does. I had one stuck once and it was close enough I guess to where WD-40 did the trick. Whew.